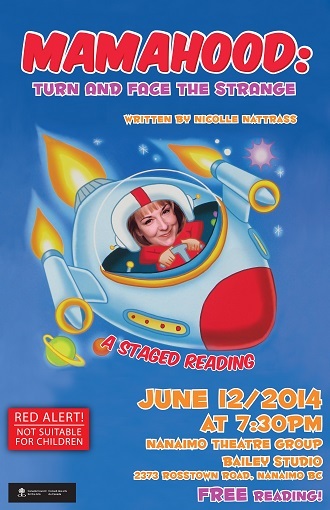 Nicolle Nattrass is an actress (CAEA / UBCP) and a playwright (PGC). She served as Deputy Chair to the Women’s Caucus, Playwrights Guild of Canada from 2009 – 2011. Her first play, a one-woman show called Brownie Points, received Jessie Richardson Theatre Award nominations for Outstanding New Play and Outstanding Performance in 1998. It has been adapted for radio and an award-winning short film, and received an American premiere. In between performing, Nicolle has managed to scrape together a couple of one acts, a lot of comedy material and a full-length play, Good House-keeping. 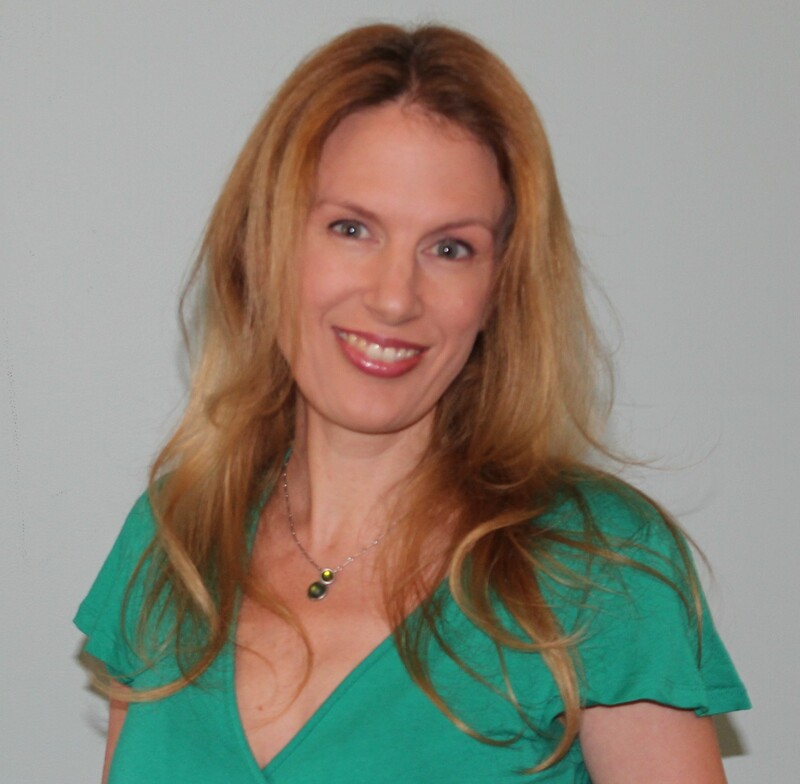 From 2010-2011, she was commissioned to write two plays for the Chemainus Theatre Festival, Countryside Christmas and Wilde Holiday Shorts, which both received professional productions. 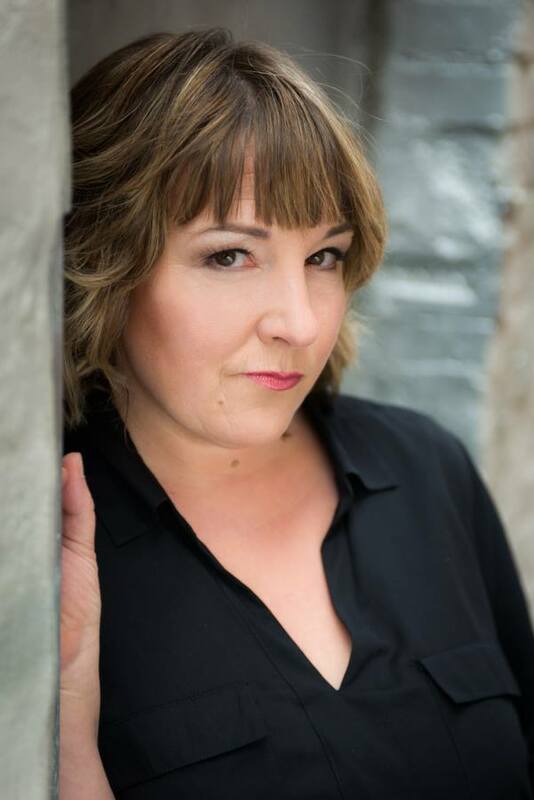 A monologue from her new solo show, Mamahood: turn and face the strange, a premiere production at TheatreOne in March 2015 in Nanaimo BC, was selected in a cabaret to celebrate International Women’s Day, produced by Sarasvati Productions in Winnipeg BC. She was also featured as a writer and performer in a new TV comedy series, She Kills Me, on APTN-TV. Nicolle is also a dramaturge and is currently Artistic Associate for TheatreOne’s Emerging Voices program, which gives new Canadian plays a professional developmental workshop as well as a public staged reading. I started to love writing in Grade 5—I won a Creative Writing award that year. I was also called into the principal’s office because of the content of my poetry booklet…so I figured writing must be pretty important. I still sometimes feel that danger that writing can get one in trouble. I was always very interested in stories. I started writing as an actor, mostly comedy sketches and monologues because I wanted to explore different characters. All of that exploration grew into a one-woman show, Brownie Points (boldly going where no brownie has gone before), which was a success. WHAT IS YOUR LATEST OR CURRENT PROJECT? I am really excited about the new solo show I wrote and now perform: Mamahood: turn and face the strange, which had its premiere production this past March. A75-minute, one-woman show, it is a sound and text exploration of Marie, an extremely sleep-deprived, 40-something new mother who dares to tell the tale of her journey to and from an alternate time and space…Planet Mamahood. This show is both funny and poignant and written to bring women together, to offer resources for women and new parents, and to bring awareness to the subjects of difficult births, post-partum depression, and post-partum traumatic stress disorder. The show is followed by an informal question-and-answer period with the actress / playwright, and a hand-out consisting of educational and informational resources for new parents in the community is made available for audience members. Small. Don’t get me wrong—I am grateful but it is small. 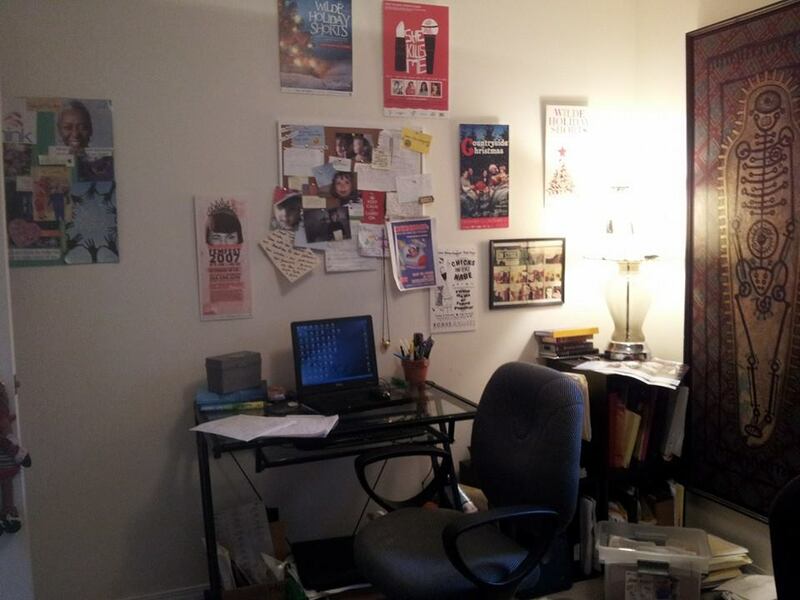 My original office became our “baby room” and so I wrote my first couple of plays on the kitchen table until I could not stand it, then moved into my partner’s office. Now we share. He is a Sound Designer / Engineer and works from home too. I should also mention that my cat, Ben, has taken to digging through our files and I often come into “the studio” and find loose papers everywhere. My best writing time is early morning. Before motherhood, I was a late afternoon, into the evening “mood writer” but I soon realized that in order to use my brain I needed to write first thing in the morning. I write fast and furiously and have trained myself to jump in while my brain is working and not yet tired. For the past year, we have chosen to do part-time school and part-time home-school, so balancing time is a huge issue. Short bursts, windows of time, and on ferry rides! I am based on Vancouver Island and whenever I travel to Vancouver, I am in heaven as ferry time = writing time. Monologues or chunks of writing usually come first or a character or the state that the character is in. I usually hold onto it until I can’t anymore and then I let it out. 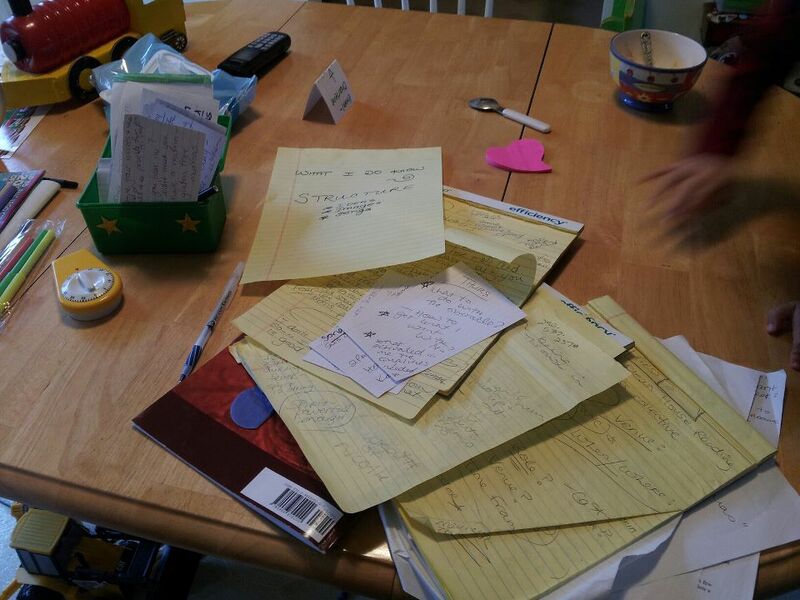 I don’t attempt rewrites without having a fresh head and a rewrite plan. I absolutely hate editing, although for my solo show, I was memorizing my lines and editing at the same time; this was an incredible and useful experience which happened organically. I read my lines out loud and edited / cut away the fat so easily as I spoke it. There is a part of me as a writer that wants to expose the inside of things and the other part of me, the actor, who really wants to not do that and wants to please. These two parts of myself affect the writing of my plays; sometimes they do battle but usually they find a nice mix together. I am inspired by the work of TJ Dawe, Daniel McIvor, and Linda Griffiths, to name a few. I want to carry a message with the work I do, to give voice to stories that need to be heard, that might not be given the opportunity to be heard otherwise. Also, a director that I respected deeply, after reading one of my plays said that she thought actors who also write seem to be more tender, they have more tender insides…I think this is why I write, to expose this rawness. Certainly in this current show, the response has been that there is so much heart in it. I am interested in showing both the light and the dark and my work always expresses both comedy and darkness. At first this was hard because everyone wants it clear—is this a comedy or a drama? I believe that you can move an audience more deeply by allowing them to open with you through laughter—then they more willingly go to the deeper places. I am always consciously aware of the emotional state of the audience. What do they need right now to stay in the story? I aim for emotional intelligence in my writing. The hardest part of what I do is in my relationship with TIME. Finding and carving out time and balancing that with the needs of my family. The other hardest part is twofold: walking out heart in hand, and being a female doing this. But it is sooooooooooo worthwhile! Being a playwright (especially female) feels like the lowest on the totem pole. I find that getting rejected at auditions as a professional actor is easier in some ways than writing a play. Being told what I am writing is “woman’s stuff” or that my opinion or input is less valued is tough. I see this happen in subtle and not so subtle ways. The discounting, the dismissals. Had I known this when I started writing, I might not have had the courage or belief in myself to tell my stories or my perspective. Now that I am aware, I just work hard to counteract it and have a great support system of women and men. One that comes to mind is to be an example for how to treat other writers. When I work as a dramaturge or as a director with a playwright on a new play I have an opportunity to treat this writer well, to honor their vision and to be respectful. This to me is GOLD. I want to be remembered as an artist who was generous, professional and KIND. I would love to see more of this in the theatre world for women and for new actors / writers starting out—a mentorship that is meaningful and respectfully nurtured. I really want my play, Mamahood: turn and face the strange, to be a powerful catalyst for healing for women so that they can feel less alone and isolated as new moms. The feedback that I received at the premiere of my solo show was from both men and women. The most surprising comments came from: a woman in her 80s who told me that my play had brought her back to those first moments giving birth, many, many years ago, a young man of 27 who told me that he thought this play was more for men than women and that he had more insight into his mother and what she went through with an emergency c-section, and lastly, another woman who was now a grandmother who told me she had forgotten what it was like to be a new mother and now that her son had a baby, she realized she needed to be more compassionate to her daughter-in-law and what she might be going through. I want my work to have lasting healing impact and to open dialogue / awareness. WHICH FEMALE WRITERS WOULD YOU LIKE TO SEE INTERVIEWED ON WORDMOTHERS NEXT? Like this interview? Follow WordMothers or Subscribe to meet more great female playwrights!